Abstract: This collection of articles, which results from the ‘Four Nations Fiction’ conference that took place in 2013, is structured around the intersection of place with gender in terms of two vibrant research fields: the archipelagic or four nations turn within literary studies and the still-expanding map of Romantic-period women’s writing. In Mary Smirke’s ‘Betgellert Bridge’ (Figure 1), a woman in a blue cloak leads a small child by the hand. Backs to the viewer, they are heading southeast along the bank of the River Colwyn in Beddgelert, in the foothills of Snowdon. It’s a summer scene: the trees are in full leaf, the river looks low, and sunlight throws shadows behind the two figures. The copper-rich bulk of Mynydd Sygun rises sharply ahead of them. Aquatint Engraving (c. 1808), National Library Of Wales. Smirke is not well known in her own right, but painting was in her blood: her Cumberland-born father, Robert Smirke, was a Royal Academician who was in turn the son of an itinerant painter. She had some success as a landscape artist and copyist, and exhibited her work at the Royal Academy between 1809 and 1814. 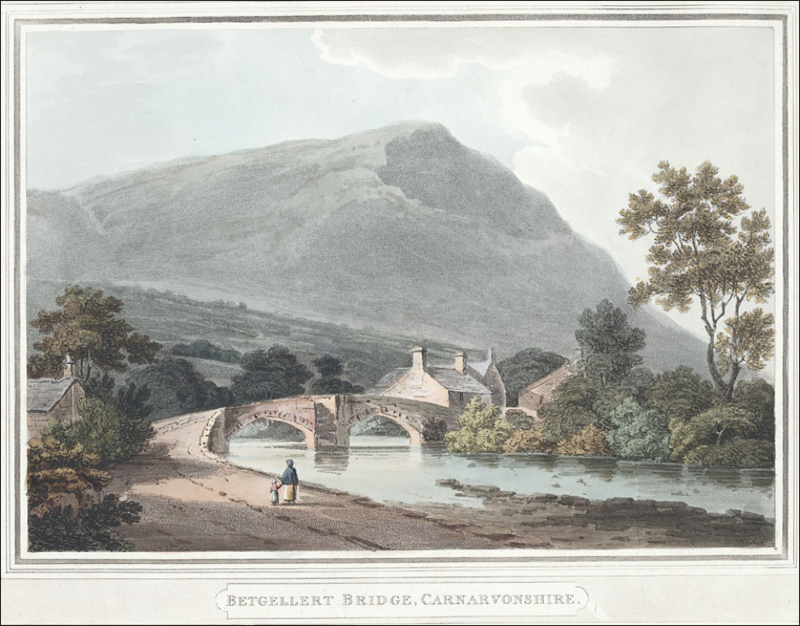 Her Beddgelert picture, reproduced here as an 1808 engraving, was probably produced just before this period, as part of a series of six topographical views of North Wales. The remaining five depict the castles at Conwy and Caernarfon, Valle Crucis Abbey just outside Llangollen, and two more scenes structured around bridges—Pont Aberglaslyn, southwest of Beddgelert, backed by another blue-grey mountain, and the gentler ‘View near Caernarvon’. Smirke’s Six Views in North Wales is a stylish set of images but none of the others matches the narrative pull of ‘Betgellert Bridge’. Oblivious to the viewer behind them, diminutive and fragile against the landscape and buildings, Smirke’s pair of figures bring not just vitality but an element of inscrutability to this image. Who are they—a mother and her daughter perhaps? Where are they going—over the bridge or down the road beyond the left edge of the frame? What will the rest of their day bring in this part of turn-of-the-century Wales, in which regional seclusion was increasingly giving way to the tourist trail? Might there more to say about the artist, Mary Smirke? A parallel train of thought, loosely applied, made ‘Betgellert Bridge’ the starting point for ‘Four Nations Fiction: Women and the Novel, 1780–1830’, an exploratory conference on genre, place and Romantic-period women’s writing, held at the National Library of Wales in 2013. As the questions above suggest, the composition of Smirke’s Beddgelert picture thematises gender and place, in a suspended or incomplete arrangement that in turn allows geographical and critical peripheries to come into focus. This collection of articles, which results from ‘Four Nations Fiction’, is similarly structured around the intersection of place with gender in terms of two vibrant research fields: the archipelagic or four nations turn within literary studies and the still-expanding map of Romantic-period women’s writing. The interval between the conference and the publication of the following papers has seen further exciting shifts. A changing sense of the period’s reading public, with a particular focus on gender, can be seen in recent and ongoing work in several fields, including periodical culture, popular fiction and travel writing. Jennie Batchelor’s recently completed Lady’s Magazine project (‘Understanding the Emergence of a Genre’) shows this long-running periodical encompassing the whole of contemporary society from fashion to domestic economy, news and politics, and literature of all categories. As documented in its wide-ranging blog, the project opens up ongoing questions about authorship, reception and remediation that have implications far beyond the study of magazines. New attention to popular fiction, meanwhile, is likely to reshape critical narratives about the novel in the period. Recent research on the prolific Minerva Press novelist ‘Mrs Meeke’, for example, has identified her as part of the Burney circle: Elizabeth Meeke was Frances Burney’s stepsister, and turns out to have surpassed Walter Scott as the most productive novelist of the Romantic period. Critical and editorial work-in-progress on travel literature, from infrastructure to coasts, in manuscript (a much-neglected area of the genre) as well as print, highlights the experience and construction of place in the period in ways that do not always or explicitly involve allegories of nation. As Mary-Ann Constantine shows in her essay included in the following collection, there is more to be said about the ways in which movement structures contemporary novels, as protagonists and plotlines travel within and around the British Isles especially. Perhaps not coincidentally, all three of the areas detailed above redefine middlebrow territory as worthy of serious study, in forms of reading and writing that represent ‘an essential element of women’s authorial experience’, as Amy Culley has recently written of life writing (itself another currently expanding literary category). The broad context sketched above has been accompanied and furthered by continued efforts to edit and reissue novels, or by offering them, often for free, in digital formats, which have transformed the availability of many rarer titles. The reissue of lesser-studied works, such as Lady Morgan’s The O’Briens and the O’Flahertys (edited by Julia M. Wright for Broadview in 2013), Mary Brunton’s Self-Control (edited by Anthony Mandal for Pickering & Chatto in 2014) or Jane West’s A Gossip’s Story (edited by Devoney Looser, Melinda O’Connell and Caitlin Kelly for Valancourt Books in 2015), have moved these novels and their creators into new zones of reception and criticism. So much so, that the crucial role played by scholarly editing in the recovery of women’s writing over the last two to three decades, has itself become the subject of critical reflection, as in Amy Culley and Anna M. Fitzer’s forthcoming Editing Women’s Writing, 1670–1840. But as literary canons continue to be contested and reconfigured by new readings and editions, where should we be looking next, and why? The four nations or archipelagic approach that defines this special issue emphasises the multiple nations and regions within the British Isles, as a series of comparative, overlapping or imagined spaces. Reflecting this multiplicity, collections such as Sheffield Hallam University’s CW3: Corvey Women Writers on the Web database, or Cardiff University’s British Fiction 1800–1829: A Database of Production, Circulation & Reception abound with titles that reference places in Britain and Ireland (as well as continental Europe), and which are set anywhere from the middle ages to the present day. Even a brief look through these databases’ long lists of unfamiliar works featuring ‘Caledonian Sirens’, ‘Romance in Wales’, as well as a host of national and regional markers among the moral tales and historical fictions, reveals the Romantic-period novel as perhaps unexpectedly constructed around domestic space—though it can obviously be impossible to tell where a novel is set from the title alone. Ann Julia Hatton’s final novel Gerald Fitzgerald: An Irish Tale (1831) clearly signals location, but there’s no hint inthe title of her 1821 Lovers and Friends: or, Modern Attachments that this is essentially a Lake District novel. This wider body of work has not been extensively studied. But building on the work of Devoney Looser, Jennie Batchelor and others, this collection of articles aims to contribute to an emerging new landscape of Romantic-period women’s writing. What might this landscape be like? The inclusion of writers such as Jane West and Mary Brunton may mean recovering and perhaps rethinking more of the conservative or evangelical fiction popular in the first years of the nineteenth century—work recently begun by Anthony Mandal. It may involve identifying new directions within travel writing, antiquarian writing, or the miscellaneous forms of the national tale and historical novel, especially those by lesser-known writers. It may mean engaging more widely with work issued by publishers of popular fiction, or with the place of prose fiction in periodical outlets, or in manuscript form—all areas currently under research. As a means of retrieving a number of little-known authors and novels, the articles brought together here focus on the ways in which geography offers women writers structuring principles, plot devices, polemical points of entry, access to real or symbolic orders, or to recognisable aesthetic discourses—often simultaneously. This collection’s guiding framework of four nations fiction emphasises literary and cultural exchange throughout. The following articles present, for example, the figures of Mary Wollstonecraft or Robert Bage filtered through the prism of Wales. They explore negotiations of Irishness or Englishness across contemporary novels and other art forms: Jane Austen in relation to Regina Maria Roche or Thomas Moore. They discuss the distribution, perception and representation of boundaries, limits and restrictions in the period, from politics, social convention and religion to women writers’ often uneasy relationship with the concept (and consequences) of publication. They open up new themes, such as the role of infrastructure in national fiction or the connections between antiquarian knowledge and the form of the novel. In the first of these articles, Mary Chadwick takes a transnational perspective on the little-known Mary Barker to reveal a formally and conceptually noteworthy novelist. In Chadwick’s account, Barker’s A Welsh Story (1798) features as an experimental novel, ‘an exploration of lives lived according to the Wollstonecraftian principle of sound, rational education’. As this quotation will suggest, Chadwick’s article addresses a gap in the British reception of Wollstonecraft, in a careful and sustained tracing of the overlaps between Barker’s novel and Wollstonecraft’s second Vindication. Though acknowledging that ‘Barker is not idealistic enough to suggest that the country is immune to the spread of metropolitan values’, Chadwick argues that in this novel Wales (specifically Glamorgan in South Wales), defined by its distance from London, represents a microcosm of the ideal British state: a benevolent, enlightened space in which women may become citizens of a rational society, or in which to stage ‘a […] “REVOLUTION in female manners” ’. Whether they agreed with her or not, few of Wollstonecraft’s contemporaries ignored her. The second article in the collection, by Yi-Cheng Weng, moves from Wollstonecraft as examplar to object of satire, in the still ‘not yet fully acknowledged’ work of the Scottish novelist Elizabeth Hamilton. Weng draws out Hamilton’s Scottish context as crucial in her construction of a conservative, Christianised moral philosophy for women in Memoirs of Modern Philosophers (1800), a novel that sets the themes of education and rational reflection to very different purposes from those of A Welsh Story. As in Barker’s novel, however, dialogues based on place feature strongly in this work, which sets up a London-Edinburgh opposition in order to contemplate competing models of social theory, manners and morals. Weng’s discussion also brings out the nuanced quality of fiction written by women in response to contemporary politics, recognising Hamilton’s novel as part of a slower and longer paper war than the one usually associated with the 1790s, in which the form of the novel was part of a wider battleground for political and cultural authority. Articles three and four, by Nicola Lloyd and Andrew McInnes respectively, shift attention to Ireland and England, via two of the more canonical figures within this collection: Sydney Owenson (Lady Morgan) and Jane Austen. However both articles bring new, and place-driven, perspectives, in Lloyd’s close reading of Owenson’s little-discussed novel O’Donnel (1814) and McInnes’s analysis of Emma (1816) in relation to a particularly spectral form of Irish gothic that emerges in part from Austen’s use of material whose meanings may be less immediately recognisable to modern readers than they were to contemporary ones. Building on the work of Claire Connolly, Lloyd’s article investigates the representation of Irish space and infrastructure in O’Donnel to show how geography ‘becomes a site of cultural anxiety in the Romantic national tale’ in both local and wider contexts. The concept of improvement is central to this analysis, which illustrates the tensions between the notion of improvement-as-incorporation—as a threat to Ireland’s identity—and improvement as a necessary element of modernity and progress. Lloyd shows how Owenson’s perception of the ambiguities around the debate prompts a new realism within her work, in a new form of national tale that ‘offers a fuller engagement with the contemporary context of Irish improvement in the post-union period’. For Owenson, Lloyd argues, the conflict between politicised and aesthetic experiences is overwhelming, and points towards the conclusion that the cultural history of Ireland cannot be mapped by an imperial system of improvement: instead, progress ‘can only emerge from within Ireland itself’. Questions of perspective and cross-cultural conflict also lie at the centre of Andrew McInnes’s study of Emma (1816), a novel sometimes described as a kind of English national tale. McInnes, however, demonstrates that Emma almost invisibly derives considerable energy from disavowed Irish dynamics. His reading of this work identifies an othered Ireland as a force that threatens to fracture the tight-knit English identity Austen’s novel celebrates. Mapping out a gothic geography on Emma’s margins, McInnes shows that the novel’s intertextual relationship with The Children of the Abbey (1796), a popular gothic romance by the Irish novelist Regina Maria Roche—little-known today but a strong contender for the most four nations of all Romantic-period novels for its Wales–London–Ireland–Scotland plotline—and also with Thomas Moore’s Irish Melodies, complicates and arguably compromises its prevailing mood and message by articulating unspeakable desires, and silenced histories. Numbers five and six return the focus to Wales, in accounts of two writers who deserve further study: Ann Julia Hatton (‘Ann of Swansea’) and Catherine Hutton. Both were long-lived, wide-ranging writers: Hatton (who was a younger sister to Sarah Siddons) as a poet, librettist and author of some fourteen novels, and Hutton as an editor, novelist, travel writer and journalist. The Worcester-born, Atlantic-travelling Ann Hatton’s reinvention of herself as ‘Ann of Swansea’ was, as Jane Aaron points out here, ‘an unusual move in any epoch’ but it was ‘virtually unprecedented’ in the early years of the nineteenth century. In this article, Aaron traces first the emergence of Hatton’s politically radical, proto-feminist and Welsh identities—the first of these sharpened by her experiences of 1790s America—and then her fictional representations of Wales. Like Barker’s A Welsh Story before it, her first novel, Cambrian Pictures (1810), links Welsh locations with ‘a harmonious state in which the inhabitants are at one with nature’, in opposition to an English gentry class that embodies corruption and avarice. Her later novels, though, register more complex views. Chronicles of an Illustrious House (1816) is a biting roman-à-clef—with a manuscript key—that satirises the fashionable, socially-aspiring inhabitants of Swansea (‘Gooselake’ in the novel) on the South Wales coast. And yet Hatton clearly remained invested to some extent in the notion of Welsh exceptionalism, as in her 1822 novel, Guilty or Not Guilty, which revives some of the ‘native virtues’ that structure Cambrian Pictures. In that novel, Aaron notes, Hatton depicts Welsh women as freer and hardier than their English equivalents, who are more often than not confined to prison-like urban existences intolerable to the ‘mountaineer […] pure and honest’. Hatton’s opposition of Welsh liberty and English confinement forms the central theme of Catherine Hutton’s second novel, The Welsh Mountaineer (1817), discussed here by Mary-Ann Constantine. Constantine shows that as a travel writer, Hutton (sometimes drawing on Thomas Pennant’s landmark A Tour in Wales, published between 1778 and 1783)registers an open-minded ‘curiosity about Welsh culture and history’, in precise and dynamic accounts of being on the road. How far it might be possible to chart changing technologies of periodical publication and of travel on the form of the novel perhaps remains to be seen, but this article makes a start by tracing the close relationship between Hutton’s firsthand experience of the home tour and its fictionalised forms in her three novels. As Constantine shows, travel and fiction are mutually reinforcing in Hutton’s writing career: the travel narratives confirm that her ‘profoundly utopian view of Wales as a space of physical freedom for women’ in her novels is ‘not only a literary trope, and should be taken seriously’. To draw connections across individual works and across the period, Hutton’s fiction also synthesises several of the themes discussed above, from Ann Hatton’s polemically idealised Wales to Mary Barker’s endorsement of Wollstonecraft. Hutton’s 1819 novel Oakwood Hall, which issubtitled ‘including a description of the lakes of Cumberland and Westmoreland, and a part of South Wales’, depicts Wollstonecraft as a ‘daring and ardent’ pioneer: an enduring touchstone for women writers still feeling their way along the boundaries identified and challenged by her. The final essay in this collection, by Diane Duffy, explores a different set of limits and boundaries for women writers, at the very end of the period discussed here. Duffy’s piece offers the first modern critical account of the Devon-based Anna Eliza Bray, whose fictional, historical and biographical works on subjects ranging from local legends to the life of Handel—amounting to more than twenty volumes in total—brought her popular success in the mid-nineteenth century. Duffy focuses on Bray’s negotiation of the literal and formal spaces of writing, and the effects of place or location on her construction of a fictional mode that could also accommodate political history, antiquarianism and topography. Like Catherine Hutton, Bray emerges in this article as an informed and intrepid figure, willing to confront boundaries physically (as in her antiquarian fieldwork) and in her writing life. Duffy argues that Bray aimed to represent ‘the private face of public history’ in novels that weave family documents (letters, diaries) into works that are also framed by scholarly prefaces and footnotes. But fashioning an English national tale with the capacity for memorialising regional history and tradition in the new world of the United Kingdom was also, Duffy suggests, top of Bray’s writerly agenda: nostalgia and elegy characterise her regional romances, in a distinctive fusion of antiquarian enquiry with Anglican loyalism. Anna Eliza Bray’s long writing career offers one route to determining the role of a region or locality in the nineteenth century’s new age of union. But emphasising place also creates entry points for writers who have not benefited from the recovery project of recent decades, and which remains particularly uneven in terms of differences of language and nation. There are signs, however, that novels known until now only as titles on database lists will receive new attention. Currently underway, for example, is The Cambridge Guide to the Eighteenth-Century Novel, 1660–1820, edited by April London, which will be simultaneously published in print and online (the print version is expected to run to 10 volumes). This work—the most ambitious and comprehensive to date—will provide critical summaries of fictions from the period at all stages of reception, from the canonical, such as Lady Morgan’s The Wild Irish Girl (1806), to the currently emerging, such as Jane West’s medievalist Alicia de Lacy (1814), to the unknown, as in Sarah Lansdell’s Welsh-set The Tower; or, the Romance of Ruthyne (1798). The challenge from that point onwards might be to move from this kind of bibliographical work, expansive (and hugely welcome) though it will be, to more qualitative and interpretive accounts—a position to which the articles in this collection aspire. Professor Harriet Guest warmly supported the 2013 conference on which this collection is based. Harriet’s pioneering work on women’s writing of the long eighteenth century will be directly and indirectly felt in several of the articles in the following collection, which is dedicated to her with gratitude and respect. 1. Tina Fiske, ‘Smirke, Robert (1753–1845)’, Oxford Dictionary of National Biography, (Oxford: OUP, 2004) <www.oxforddnb.com/view/article/25762> [accessed 13 Mar 2016]. 2. Aquatint engravings of Smirke’s Six Views in North Wales are held in the collections of the National Library of Wales: see e.g. ‘Conway Castle’ <https://commons.wikimedia.org/wiki/File:Conway_Castle_(1133139).jpg>. 3. Claudia Kairoff, Anna Seward and the End of the Eighteenth Century (Baltimore: Johns Hopkins University Press, 2011); Claire Grogan, Politics and Genre in the Works of Elizabeth Hamilton (Farnham: Ashgate, 2012); Judith Bailey-Slagle, Romantic Appropriations of History: The Legends of Joanna Baille and Margaret Holford Hodson (Plymouth: Fairleigh Dickinson University Press, 2012). 4. Andrew Monnickendam, The Novels of Walter Scott and his Literary Relations (Basingstoke: Palgrave Macmillan, 2013). Monnickendam notes at the outset of his discussion that ‘giving the three novelists critical independence’ produces ‘a more complex and diverse picture of their writing’ (p. 1). 5. Fiona Price (ed. ), ‘Romantic Women Writers and the Fictions of History’, special issue of Women’s Writing, 19.3 (2012), and Reinventing Liberty: Nation, Commerce and the Historical Novel from Walpole to Scott (Edinburgh: EUP, 2016). See also Reading Historical Fiction: The Revenant and Remembered Past, ed. by Kate Mitchell and Nicola Parsons (Basingstoke: Palgrave Macmillan, 2013). 6. For ‘The Lady’s Magazine: Understanding the Emergence of a Genre’ Leverhulme-funded research project and blog, see <www.kent.ac.uk/english/ladys-magazine/>. 7. Simon Macdonald, ‘Identifying Mrs Meeke: Another Burney Family Novelist’, Review of English Studies, 64 (2013), 367–85 <https://doi.org/10.1093/res/hgs141>. 8. Some sixty previously unpublished tours of Wales and Scotland—including familiar figures such as Hester Piozzi and Jane West, as well as those unknown to us beyond their handwritten home tours—will be published online as part of the AHRC-funded research project ‘Curious Travellers: Thomas Pennant and the Welsh and Scottish Tour (1760–1820)’ <http://curioustravellers.ac.uk/en/>. 9. Amy Culley, ‘Women’s Life Writing in the Long 18th Century: A Critical Survey’, Literature Compass, 12.1 (2015), 2 <https://doi.org/10.1111/lic3.12201>. 10. See e.g. Chawton House’s Novels Online series <www.chawtonhouse.org/?page_id=55488>. 11. Devoney Looser, ‘Introduction: Jane Austen and her Contemporaries’, The Eighteenth Century, 56.2 (Summer 2015), 147–49 <https://doi.org/10.1353/ecy.2015.0017>. 12. Juliet Shields addresses the internally divided nature of eighteenth-century Scotland, and its effects on the development of a distinctively Scottish form of the national tale, in Sentimental Literature and Anglo-Scottish Identity, 1745–1820 (Cambridge: CUP, 2010). 13. See ‘Introduction’, Mary Brunton, Self-Control, ed. by Anthony Mandal (London and Brookfield, VT: Pickering & Chatto, 2014), pp. xiii–xliii. 14. Cheryl A. Wilson, ‘ “Something like mine”: Catherine Hutton, Jane Austen, and Feminist Recovery Work’, The Eighteenth Century, 56.2 (Summer 2015), 151 <https://doi.org/10.1353/ecy.2015.0010>. 15. See, respectively, <http://extra.shu.ac.uk/corvey/> and <www.british-fiction.cf.ac.uk/>. 16. Ina Ferris, The Romantic National Tale and the Question of Ireland (Cambridge: CUP, 2002), p. 50. 17. Penny Fielding, ‘Genre, Geography and the Question of the National Tale: D. P. Campbell’s Harley Radington’, European Romantic Review, 23 (2012), 593–611 <https://doi.org/10.1080/10509585.2012.709797>. 18. Fielding observes that ‘[t]he national tale is eclectic in its generic relationships, mixing motifs from sentimental and courtship novels, and growing up alongside the historical novel with which it exchanges ideas, themes and tropes’ (ibid., p. 599). 19. Anthony Mandal, ‘Evangelical Fiction’, in The Oxford History of the Novel in English, Volume 2: English and British Fiction, 1750–1820, ed. by Peter Garside and Karen O’Brien (Oxford: OUP, 2015), pp. 255–72. 20. See, e.g., Emily C. Friedman, ‘Manuscript Fiction in the Archive’, 18th-Century Common (June 2016) <www.18thcenturycommon.org/manuscript-fiction-archive/>.